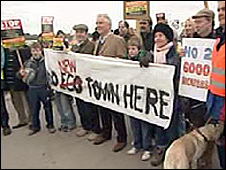 Government plans for a proposed eco-town in south Warwickshire will not be backed by the local council. Stratford-on-Avon District Council is to write to the government asking for the development, at Middle Quinton, to be removed from the shortlist. The site is among 15 shortlisted to become what ministers say will be "environmentally-friendly" towns. Protesters gathered in Stratford to urge members to reject the plans. The debate was streamed live on the web. The final 10 sites will be chosen in the next six months and work on them is expected to start by 2020. Council leader, Les Topham, said this was only the first stage for the council. "The district council has made its intentions clear not to support the proposed development and the district council is very unhappy to developments like this imposed on us by the government," he said. Paul Lankester, the council's chief executive, said the government would decide if the scheme went ahead. He said the council debate had been over the council's "policy position" and whether or not it agreed with the principle of the scheme. Opponents from the Better Accessible Responsible Development (Bard) campaign have said the development will lead to congestion in nearby villages as new home owners travel to work and take children to school. They also argue there has not been enough consultation and that the schemes will be an excuse for building houses in inappropriate places. However, housing minister Caroline Flint has said the scheme will help to tackle climate change, as well as providing affordable new housing. Ministers also say the new towns will be low energy, carbon-neutral developments.